My pointy hair and I have been thinking about this topic a lot over the last six months and it was finally time to sit down at a keyboard and get it out. There are a lot of things that determine job satisfaction in this world. Money, benefits, being challenged and not bored, work/life balance, commute time and more. 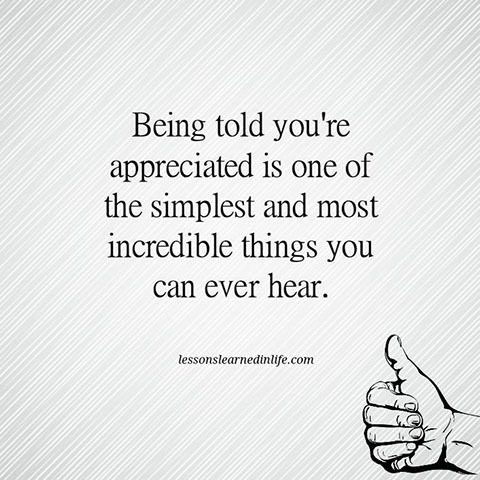 To me however, one of the most important things is simple appreciation for the work that you do. Now I work in IT. And in IT you have to have pretty thick skin as generally the only time people tend to talk to, or about IT, is if something is malfunctioning. Joe Blow can’t get his email or Jane Doe can’t get to her files. When everything is running smoothly and all systems are at 100% we simply don’t exist. No one tends to realize how much work goes into maintaining networks, servers, laptops, desktops, tablets, software stacks, phone systems, mobility options, printers, wireless connectivity, software development, security and everything else that a typical IT team deals with. In addition, we, as IT Professionals, would never fathom that we could do the job of a carpenter, accountant, or a mechanic better than those experts in their fields. Yet, anyone with a smart phone seems to think they know how to run an IT organization. It’s frustrating, but it comes with the territory, and most of us in IT have grown to understand this phenomenon and deal with it accordingly. We have grown to accept the fact that folks rarely show us any appreciation. It’s kind of a sad reality, but one I know every IT person reading this can relate to in some form. Now in my role as an IT leader, I try hard to let my team know how much I appreciate the work they do. I thank them often, and let them know that the work they do matters TO ME. That I appreciate what they do, and how hard they work, and all the long hours they put in when issues rear their ugly heads. Now sometimes even within an IT organization, teammates will bicker about each other, and still focus on the bad stuff some people do, without ever considering all the good things a person brings. This is also detrimental. Situations aren’t always ideal, and you need to look at the good as well as the bad traits someone may exhibit. There’s always a tipping point mind you, and bad employees do have to be dealt with, but if no one ever has an appreciation for what others bring to the table, how can they expect to be appreciated themselves? There’s not much worse than knowing you’ve sweat and bled for something you’ve done and no one gives you any sort of credit for it. So if you manage a staff, let them know how much their hard work means to you. And mean it, don’t just say it. If you work with others, let them know. Thank them and let them know that their work hasn’t gone unnoticed. And even random people you deal with, thank them and let them know that you recognize how hard they work. Simple appreciation that someone works hard to be good at what they do (no matter what it is) goes a very long way. I like to think I’m a decent manager, and I hope I’ve been good at telling my staff that I really couldn’t do my job without them. I’ve worn the pointy hair in my current gig for nearly 8 years now, and I am insanely proud of all we’ve accomplished with so little. I know what we’ve done, and I know how hard everyone worked to get to where we are. I’m full of gratitude and appreciate for that. And I try to let them know as much as possible.